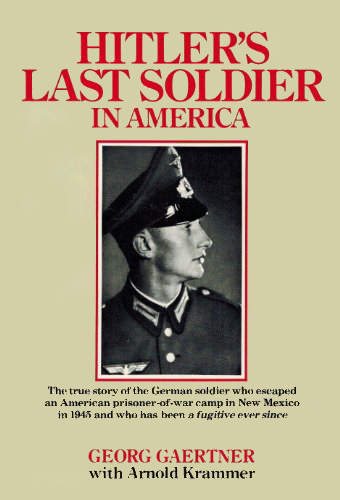 It is the personal story of Georg Gaertner, a German Prisoner of War who escaped from a camp in Deming, New Mexico, to avoid being sent back to his hometown in East Prussia, which had come under Soviet occupation. He slipped into American society and lived a quiet American life as Dennis While for forty years before deciding it was time to come clean. The final German fugitive became a story that made headlines. Georg Gaertner, a tall gawky 24-year old Afrika Korps sergeant, had escaped from Camp Deming, New Mexico, on September 21, 1945. As a camp translator, Gaertner learned about Washington's decision to repatriate all POWs to their home towns; the trouble was that his home - Schweidnitz, in East Prussia - was now in Soviet hands. Nights later, he boldly rolled out under the barbed wire fences and caught a distant freight train for whatever destination Fate offered. He landed in California. He lived the next forty years under a variety of names as a dishwasher, lumberjack, migrant farm worker, ski instructor, and tennis pro. In 1985, a successful construction estimator and social gadfly who played tennis with such film stars as Robert Stack and Lloyd Bridges, Gaertner - now Dennis Whiles - decided for personal reasons to come forward. He surrendered to this author and ultimately appeared on national television on September 12, 1985. The entire intriguing story, jointly written, became a popular book entitled Hitler's Last Soldier in America. According to his book, an exception to leading a quiet life was taking part of the first ski rescue team to the City of San Francisco in January 1952, immediately after which Life magazine took his and the group's picture. 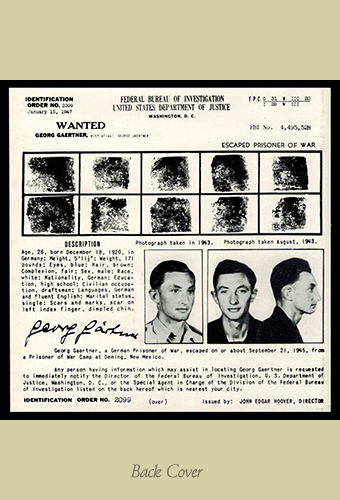 Meanwhile, his FBI wanted posters were posted in most post offices across the country.